"Monsal Dale may with peculiar propriety be termed the Arcadia of Derbyshire." When viewed from Monsal Head Monsal Dale is one of those places that takes your breath away. In 1827 Richard Ward described how any traveller standing "on the brow of a lofty and steep mountain, and casting his eyes to the bottom of it, if he is not utterly destitute of a taste for the beauties of nature, he will be struck with the highest admiration by a complete view, suddenly presented, of the charming Monsal Dale, stretching to the right and left immediately beneath him". The same could still be said today. The first picture is looking downstream, over the railway viaduct towards Fin Wood on the valley's side and Fin Cop, where there used to be an old lime kiln. The building of the Rowsley to Buxton extension of the Midland Railway, begun in 1860, completely changed the Monsal valley. By the mid autumn of that year work had started and a hundred men were employed near Bakewell, with stabling put up for 50 horses. 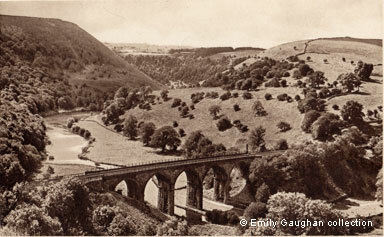 A viaduct was to be built across the dale, 100 yards in length and with arches 60 feet high and a 50 foot span. From the outset the Rowsley and Buxton Railway was said to be one of the most picturesque in England, with the view at Monsal Dale the most imposing. At one end it was to be accessed from a tunnel said to be of solid black marble and the traveller, on emerging from it, was expected to be struck with amazement at the beautiful sight before him. 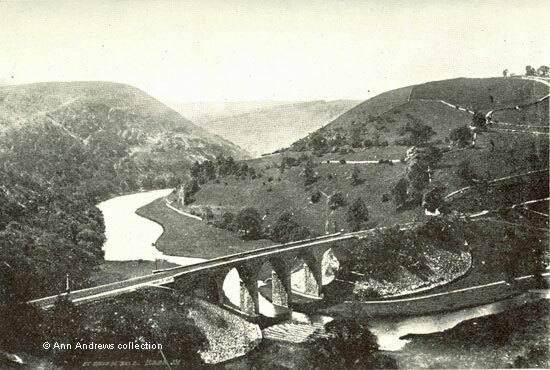 The viaduct over the River Wye was being built of black marble removed from the tunnel; some of the blocks weighed four to five tons. The line then went into another tunnel, going on to Cressbrook Dale. When one of the Monsal piers was nearly finished in April 1861 it was said that the black marble "gives it a very noble and firm appearance". The head engineer was A. Chambers, Esq., who worked for Messrs. Rennie and Co. It was Mr. Chambers who supervised the work on all the tunnels and viaducts. One minor incident occurred in August 1861 when Joseph Timm's hen roost was broken into and fourteen of his fowls were stolen. The culprits scattered feathers in front of the huts near the viaduct where the navvies were housed, undoubtedly a ruse to blame the railway workers for the birds' disappearance. In January 1863 there was a far more serious incident. A stone fell from one of the arches and hit the head of a 25 year old labourer from Tideswell called William Sutton who was working on the viaduct. He was killed immediately, and a verdict of Accidental Death was recorded at the inquest that followed. The new line between Hassop and Buxton was opened in June 1863. A special train, with its engine decorated with flags and evergreens, left Derby at 10a.m., picking up a few people en route to Hassop where the Duke of Devonshire and a party from Chatsworth embarked, plus Mr. Thornhill, M.P. who had travelled up by train from London. The journey to Buxton perhaps took longer than expected as it did not reach its destination until after 1p.m. because there were pauses along the way to admire various things of interest. It had taken approximately two years and three months to build, with the number of navvies averaging about 1,000. John Ruskin, the Victorian art critic, was scathing: "That valley where you might expect to catch the sight of Pan, Apollo and the Muses, is now desecrated in order that a Buxton fool may be able to find himself in Bakewell at the end of twelve minutes, and vice versa" (Fors Clavigera). In his 1890 guide R. N. Worth described the journey by rail. "After leaving Longstone we soon enter a tunnel [Headstone tunnel], emerging from which we find ourselves in the beautiful scenery of Monsal Dale. Looking down to the l[eft] the view of the Wye winding round the base of Fin Cop is very fine". Charles Cox, in 1915, thought the Dale remained mostly unspoiled, despite express trains whistling through every few minutes. He recommended actually visiting in person, rather than rushing through it in a train, as it was well worth the journey. The Headstone Tunnel, re-opened in the last few years, is just out of shot on the left. There had been plans to erect another viaduct at Monsal. In 1891 the Lancashire, Derbyshire and East Coast Railway Bill was being considered and it was proposed that a second viaduct should be built here, about 200 feet above the Midland Railway line. If built it would be the highest in England and the estimated cost was £73,000, with building work expecting to take about two years. The three photos that feature the viaduct (above) show that this plan did not reach fruition. Following the Beeching closures of the 1960s the defunct line was converted into Monsal Trail, something enjoyed by many, and is now part of the Peak District National Park. Derbyshire's Parishes, 1811, Parishes M, which mentions the then recent discovery of ancient bones in a barrow on top of Great Finn. "The Gentleman's Magazine Library, 1731-1868", p.49 (near bottom of page). It is listed under Great Longstone in Kelly's 1891 Directory. 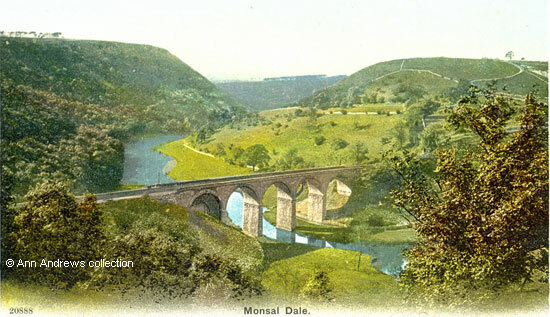 There is another postcard of the viaduct at Monsal on the series of Railway Cards. 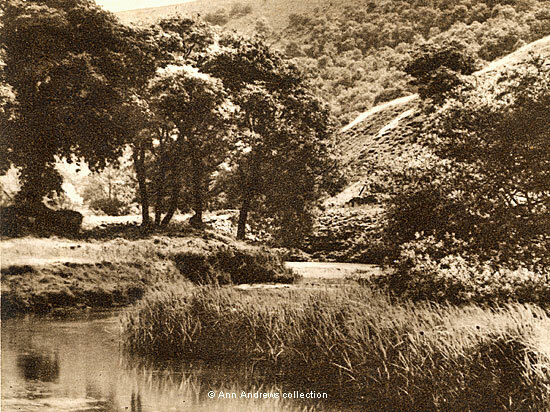 1.Postcard of "Monsal Dale". No publisher, but Picture Post Card on reverse. No.20888. Unused. Images 2 and 3. Two views on Monsal Dale, published in Mee's "Derbyshire". 4. "The River Wye in Monsal Dale" No.G5535. Published by Photochrom Co. Ltd. Copyright, Graphic Studios, Tunbridge Wells, Kent © Emily Gaughan collection. Another card was posted in 1955. 5. 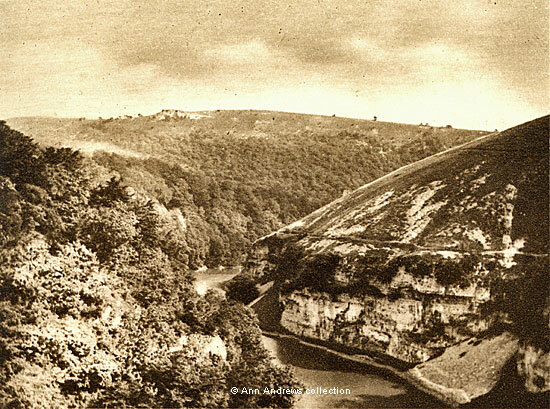 "Monsal Dale", from a photograph by Messrs. J. Valentine & Sons, Ltd.
Postcard 1 and the books mentioned in the collection of, provided by and © Ann Andrews. "Black's Tourist Guide to Derbyshire" (1888) pub. Adam and Charles Black Edinburgh. The quote is unattributed. Ward, Reverend Richard (1814) "The Matlock, Buxton and Castleton Guide, containing concise accounts of these and other remarkable places ... in the ... County of Derby", Derby. "The Derby Mercury", 17 October 1860. "Derbyshire Times and Chesterfield Herald", 27 April 1861. "Derbyshire Courier", 31 August 1861. "The Derby Mercury", 28 January 1863. Cox, John Charles, (1915, 2nd edition, revised), "Derbyshire" - Illustrated by J. Charles Wall, Methuen & Co., London, p.197. Cox was then Rector of Holdenby, Northampton. "Derbyshire Courier", 25 April 1891. Mee, Arthur (ed.) (1937) "Derbyshire: The Peak Country", The King's England Series, Hodder and Stoughton Limited, London.